It's the first week of November, and we've got some tumultuous weather ahead — a bit of rain, a bit of sun, a warmup, and a cooldown. Of course, that's what autumn and November are all about. Before I jump into the forecast, I'll remind you that everyone's sense of time is skewed at the moment due to Daylight Saving Time ending this weekend. Sunrise is now an hour earlier, around 6:33 a.m. Sunset is absurdly early at about 4:52 a.m. Daylight will just become more and more scarce as mid-December's Winter Solstice approaches. As of this writing, the initial showers from our next storm system are moving into South Jersey. 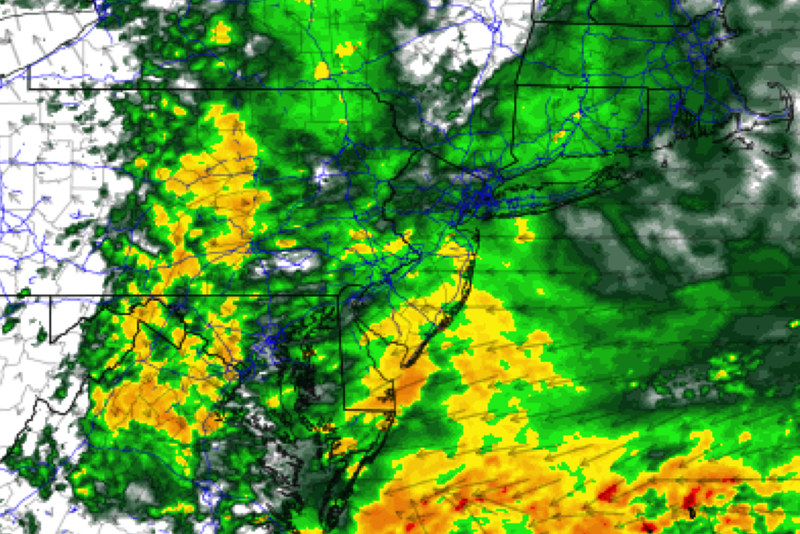 That rain will continue spreading northward, with most of the Garden State getting wet by about 8 a.m. Monday. And then it's going to rain Monday. And then it'll rain some more. I think the rainfall will be steady, but not quite heavy. Models show minimal threat of thunder/lightning and/or severe weather — it's just a wet day. And it's going to be an uncomfortably cool rain too, with temperatures climbing from the 40s only to the mid 50s by Monday afternoon. It will be breezy, with east-northeast winds sustained at 10 to 20 mph and gusts to about 30 mph. Don't expect to see the sun Monday. Showers will taper off and exit the state Monday evening. The rest of the overnight will be mostly cloudy, with fog possible (especially around southern NJ). Temps will only drop a few degrees, with lows around 50 degrees (give or take). Election Day Tuesday will start off dry and quiet. But we'll be on the lookout for a quick hit of showers and potentially strong thunderstorms Tuesday afternoon. It's going to get pretty warm, with highs close to 60 degrees in North Jersey and near 70 to the south. The big risk here will be for damaging winds mixing down to the surface — gusts over 60 mph are possible. The Storm Prediction Center puts the southwestern corner of the state in a "Slight Risk" for severe weather. Again, it will be a narrow window for rain and storms, between about 1 p.m. and 7 p.m. If you have the choice, it might be a good choice to vote early rather than later. Wednesday promises to be the nicest day of the week. We'll enjoy lovely sunshine Wednesday morning, before some fair-weather clouds arrive in the afternoon. High temperatures will remain on the warm side of normal in the lower to mid 60s. Quite pleasant. The next cooldown arrives Thursday. Yet again, it's not going to be a big, bad arctic blast, as high temperatures only descend to the mid to upper 50s. That's pretty close to seasonal norms. It should be a bright, sunny fall day. New Jersey's third and final rain chance of the week will come on Friday. It looks like a "midday to evening" event, but that timeline is subject to wiggle as the week progresses and the forecast continues to evolve. Beside the triple rain chance, our other big weather story of the week is going to be the cooler temperatures that arrive for the weekend. High temperatures will fall from the lower 50s on Friday and Saturday, into the mid to upper 40s for Sunday and beyond. It might get positively wintry by the middle of next week — the GFS model shows next Wednesday with widespread lows in the mid 20s and highs in the upper 30s. Yikes! Having said that, there are still no snow threats in the forecast for New Jersey.